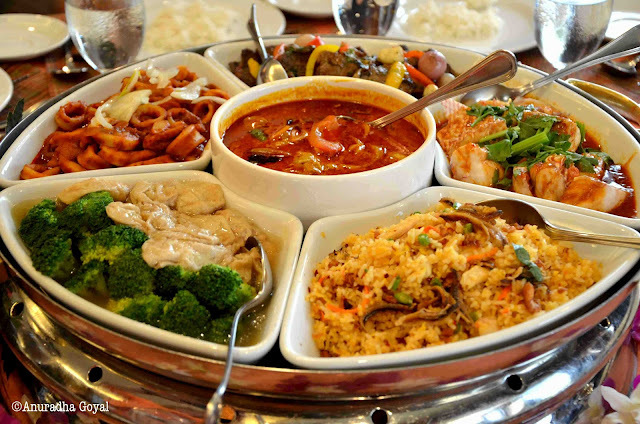 From the time I landed in Malaysia, from every local person I heard that Malaysians love to eat and they must have a minimum of six meals a day. Some of them were so skinny that I kept wondering where do those six meals go, but it was true that there was always ample food in sight. At the MITBCA, we used to reach the venue after a heavy breakfast, only to be greeted by piles of colorful tempting food. They were not just serving snacks, but a whole range of meals. Then at mid morning break there was more food. At lunch food is expected, but the morning routine repeated at the afternoon tea, after which I was told there would be supper and dinner. Hmm…that makes it six meals a day. In the evenings I went walking around China Town and Bukit Bintang and all I saw was food and food. Carts full of food, some lined in an inviting way, some raw, some cooked and some semi-cooked. In the most basic setup, the focus was just food, the aesthetics were provided by the way food was arranged, the way the colors were played with and the way the aroma filled the place. The presentation of food was interesting in both the formal places and the streets. I found the concept of a rotating set of bowls in a formal table very unique. Fruits always came in various shapes and sizes that made us pick up the camera before picking up the fork but they would call for another post to do justice. In Melaka, I had this soup that was served in the raw coconut and you can eat the pulp of the raw coconut after you have finished the soup. For a vegetarian like me, it was a sheer delight to get these dishes. In my 6 days of stay I had more Tofu than the rest of my life. Though I must say on the street there are limited options for vegetarians. Since we were all bloggers and social media experts, people would first click and tweet and then eat the food. A case of tweet before you eat. In fact a tourism Malaysia official joked that at KL airport we weigh you as you come in and you are not allowed to go back if you have not gained at least 5 kgs and with the amount of food we got to eat, that’s not too much. Moral of the story is that when in Malaysia you can get lost in food. 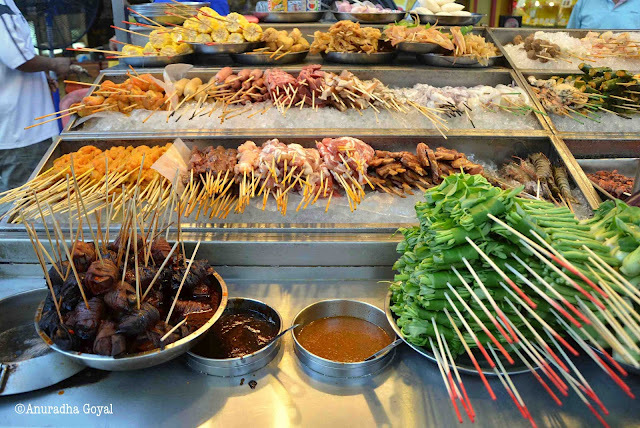 If you are a foodie, Malaysia should be on top of your list of to-be-visited places.